This is the first year that i will be going to a festival and camping the whole weekend which im super excited about but maybe a little apprehensive? The thought of festivals gets me so excited for summer and holidays. First thing that is on the shopping list is a pair of wellies, I have lusted after a pair of hunter wellies for the longest time but could never really justify the price of them. 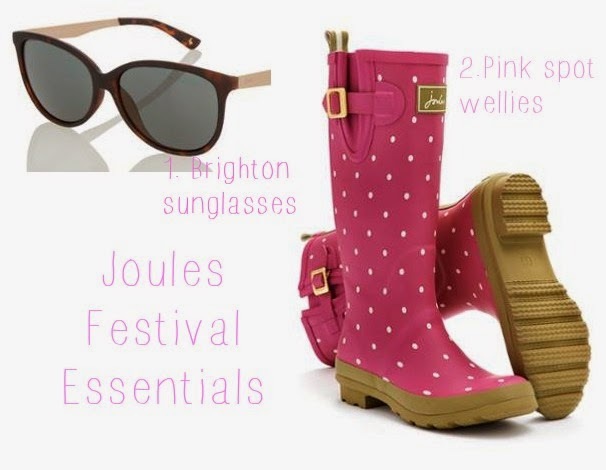 I came across these beautiful pink spot wellies from Joules for a extremely reasonable £39.95. I always think i will only ever get one or two wears out of a pair of wellies however i say this every year so i should have just invested in the first place. Even at 25, pink is my favourite colour and i love the spottyness. As a bit of a sunglasses fiend, i absolutely fell in love with these Brighton sunglasses, again from Joules. The tortoiseprint is my favourite, it works well with the gold arms and definitely not as harsh on your face as a black pair of sunglasses and slightly softer. This cat eye shape is probably my current favourite in a pair of sunglasses too.